It’s good sides are – fast withdrawal, constant CFD on goods – without expiration, quite adequate support, all in all, in other things it’s standard. It’s hard to say whether it’s good or bad, let people decide for themselves, i’m gonna trade with them for now, but if they start acting up, of course I”m gone. I see this broker as an option for diversifying risks. Threw in a few hundred, then withdrew, no problems, 3 months of trading so far, no complaints at this point, of course not perfect, goes without saying there are requotes, but they’re everywhere, everyone’s got them, but atleast they’re not often and not so irritating, read on one site there’s a possibility of solving problems with requotes, but I personally don’t need that, since these requotes appear rarely. So far neutral impression about this company, although the withdrawal is rather fast and trading is easy, have seen requotes a few times, not that it was critical, but it’s a fact, will continue to look into this broker. The broker isn’t for fussy people, for those who wants to trade and take it easy, ifc markets will suit them. I personally like it when there are all kinds of tournaments and competitions, but unfortunately they don’t have any of that. Although they do have good execution of orders and even money deposit. IFCmarkets is founded in early 2006 with headquartered in BVI. They are forex broker that provide to their clients opportunity to trade currency pairs, commodities, metals, indices, stocks, cfds and other. You can trade a lot of trading tools with fixed spread or fixed fees. You can use leverage up to 1:400 for forex trading and 1:40 for stocks. The minimum deposit is 1000 You can use also payments methods such as Visa, Mastercard, Wire transfer, Western union and other. 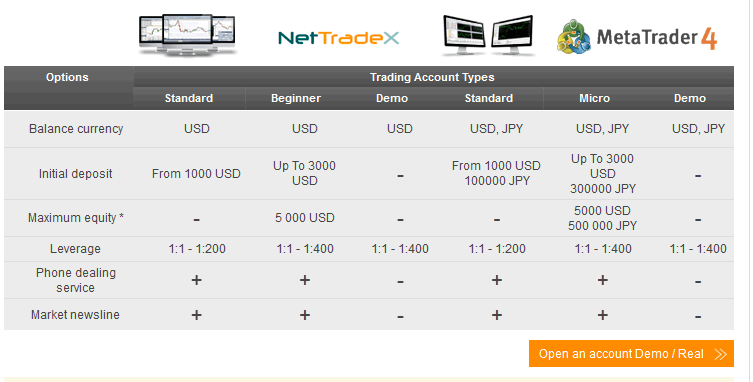 They offer different types of trading platforms such as NetTradeX, MetaTrader 4 and Mobile trading. They offer to their clients interbank swaps for forex and very small fees for the other trading tools. You can study forex with them, they will give you tutorials, ebooks and other. They offer to their clients chance to watch their video market outlook of the financial markets every week. They offer for their customers also Segregated Account, Islamic Account – Swap Free (What is Forex swap?) , Demo Account, Institutional Accounts with customer supports languages in English, Spanish, Chinese, Russian, Arabic, Turkish, Portuguese and Japanese. When you open your account you will receive also Streaming News Feed, Automated Trading, Guaranteed Limit Orders, trailing stops and also you can trade from the chart with One-Click Execution. So this broker is comfortable for scalpers, intraday traders and hedge. IFCmarkets offer special trading conditions for their vip account users such as Personal Account Manager, Flexible trading conditions, Market analysis, news, technical analysis and other. IFC Markets does not provide services for United States customers. For this moment they offer only promotion to get 2% extra annual interest on free margin.